New Regions – Why not use the ones already established by the exploration community? On the recent livestream FD showcased the changes for exploration mechanics that will be coming with update 3.3. Among these changes was the introduction of 42 numbered regions that will allow FD to spread rumors about possible places to discover within that region, as well as allowing player discoveries to propagate to other players. 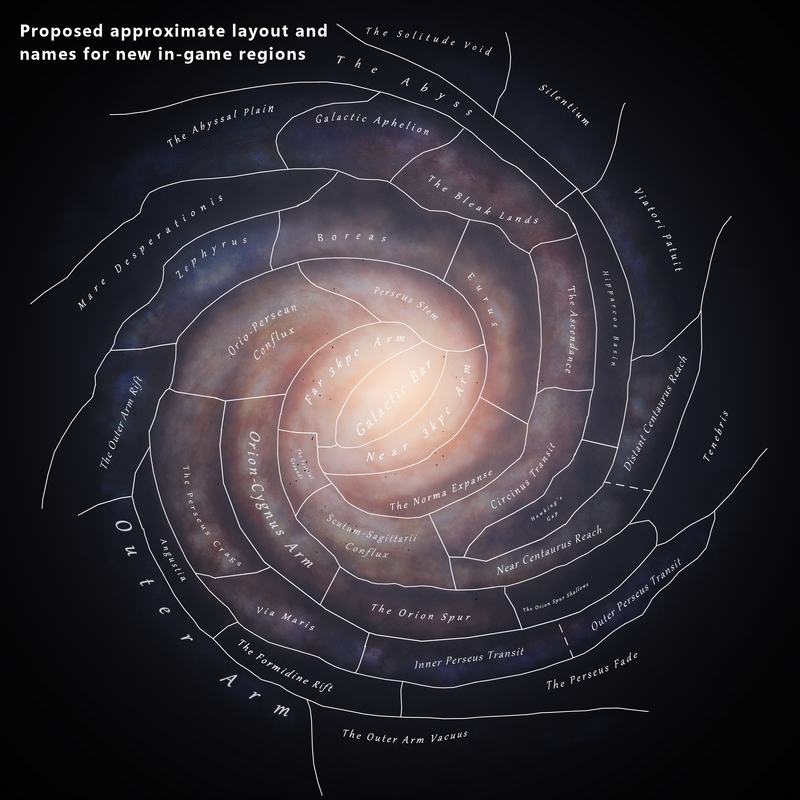 The Galactic Mapping Project is one of the oldest community projects in Elite Dangerous, and although we've always understood that the project is not an official 'naming' project that FD has adopted, we hope that the rich history that has been built up around it over the past few years would be taken into consideration when Frontier Developments implement their regional overlay for 3.3. The GMP, EDDiscovery and EDSM are projects that are widely used within the community, and the regional names have become part of the everyday lexicon for hundreds, if not thousands of players. 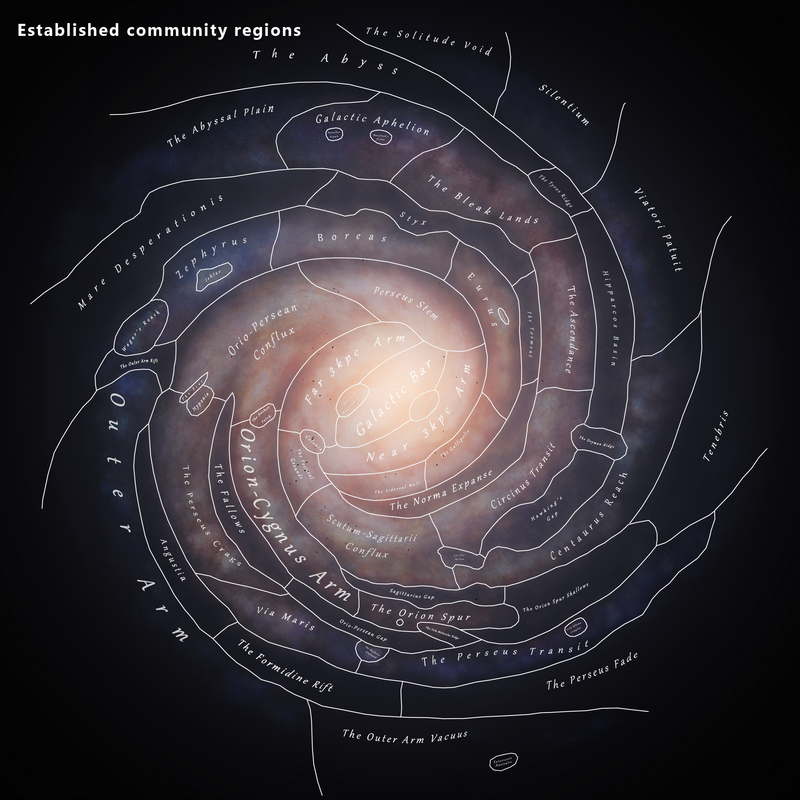 The regional names are part of the community created lore, as well as the official lore (Colonia, Hawkin's Gap and the Conflux for example are mentioned in Drew Wagar's book, Premonition - an official Elite novel.) The regional names add flavour to the galaxy that Frontiers numbers will not. The regional names are woven into the tapestry of many historic expeditions, exploration journals, blogs, and hundreds of YouTube videos created off the back of the journeys players have taken out into the black. We feel that the numbered regions introduced by FD will over time usurp the place of the regions named by the community - because the numbered region will have a game mechanic effect and thus it will be natural for people to refer to them. This would be a sad loss of the 'character' and that human touch that the community names have added to the wider gameworld for the past 4 years. There are currently 60 community named regions, and as they vary a lot in size, we understand that it is probably not feasible to ask Frontier to adobt them as they are. However, we have tried to merge and remodel the existing community regions into a map that should be more suitable for the mechanics presented by Frontier on the stream. Even if the new mechanics of Elite 3.3 only allow Frontier to roughly approximate the borders shown in this proposal, we would still count it as a huge improvement if they implement those regions using the community names. This will bring continuity to the established community lore and narrative. What we are asking is for FD to consider dropping the name "Region" from their in-game UI and instead replace it with the word "Grid" or "Galactic Sector" - as this will at least prevent confusion of having two sets of 'regions' to refer to. For example, the everyday lexicon when players describe a trip, or expeditionary waypoint, would be presented along the lines of.. "Sol, Grid 01, The Orion Spur Region. We feel that this UI change would help prevent the community submitted regional names from being undermined, and eventually consigned to history. "My proposal would be to implement the GMPs map as a view that can be toggled on and off. That way FD don't need to change anything with the work they have already done, and we can still use the names we made and refer to them as such (if wanted) when creating expeditions." The GMP team is very fond of this third proposal about an additional map layer that can be toggled on and off. We think this would be a good solution that might well be within the realm of the possible while still allowing the in-game inclusion of the regions established by the exploration community. The entire team at the GMP would like to say a huge thank you to every one of you who have shown your support for this idea and the GMP in general. This response means a lot to us - so thanks again! Community manager Will Flanagan has sent us a reply in this thread - thank you Will and the team at FD for your time and for taking this into consideration. Why not use the ones already established by the exploration community? +1 for this! Was thinking this too. I wonder if the regions are defined from the PG engine itself, rather than being human-driven? While I agree it would be great to use the maps we have, it simply may not be possible. Jumping onboard this train ! I agree with Corbin Moran.